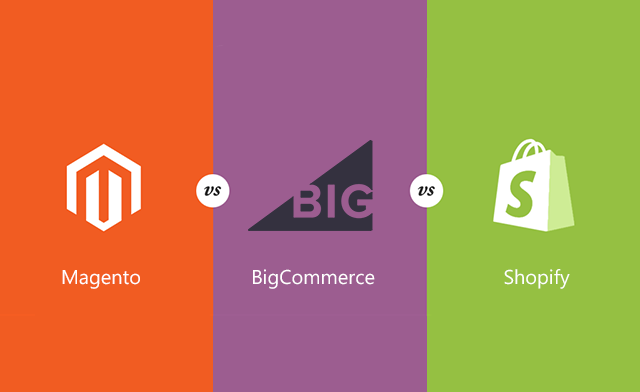 Magento, BigCommerce, and Shopify Comparison - Which is the best? Whether you’re a merchant seeking a platform to launch a new eCommerce website or thinking about switching to a new platform, it can be challenging to decide which is the best alternative for your needs. There are many options to choose from, and each platform has its unique advantages and disadvantages. The decision comes down to what features are most important to your specific business and how you want your website to function. To help merchants better understand a few of the top eCommerce platforms, we’ve created a comparison guide for Magento, BigCommerce, and Shopify. The first version of the Magento platform came onto the scene in 2008 and gained a lot of its popularity after eBay invested in the company in 2010. Magento received a massive update in late 2015 with the release of Magento 2.0 with a wide range of improvements. Magento is now one of the most well-known and respected platforms in the eCommerce community. According to BuiltWith, there are currently over 200,000 live websites powered by Magento. Magento Open Source and Magento Commerce account for 10% of the eCommerce platform market share according to BuiltWith’s top 10k sites – making Magento one of the most used eCommerce platforms worldwide. Magento offers three different options for eCommerce merchants: Magento Open Source, Magento Commerce, and Magento Commerce (Cloud). Magento Open Source, previously known as Magento Community Edition, is free to download and works well for growing businesses that want a fully scalable and customizable website. Magento Commerce, previously known as Magento Enterprise Edition, is an all-in-one paid solution for larger businesses. Magento Commerce offers additional features not available in Magento Open Source including added B2B sales functionality, advanced marketing tools, and added search capabilities, just to name a few. Magento Commerce (Cloud) includes all of the features in Magento Commerce but with added cloud hosting capabilities. With cloud hosting, websites load lightning fast and are optimized for every customer no matter their location. Magento runs Commerce (Cloud) on the Amazon Web Services Cloud, eliminating the need for self-hosting. Low-cost developers who advertise expertise but can totally cripple a site with improper customizations (hacks). Cost of upgrading and patching is significant and in many cases is two to three times the annual costs of hosting. To find more information on the difference between Magento Open Source and Commerce, reference this comparison post. BigCommerce was first introduced in 2009 but didn’t take off until early 2012 after receiving millions in funding. By 2015, BigCommerce launched an Enterprise version created for high-volume merchants. Currently, BigCommerce powers more than 57,000 live websites and accounts for 1% the eCommerce platform market share according to BuiltWith’s top 10k sites. The platform is software as a service (SaaS) based and is a hosted solution. In contrast to Magento Open Source and Commerce, BigCommerce takes care of hosting for its merchants. BigCommerce also offers educational resources to assist merchants. BigCommerce offers two eCommerce solutions including BigCommerce and BigCommerce Enterprise. BigCommerce is a hosted solution for small merchants who are still growing. It’s a feature-rich solution with built-in selling for third party marketing places like Amazon and eBay. BigCommerce Enterprise is a cloud-based hosted solution for medium-sized and larger merchants. The Enterprise version includes marketing tools, real-time analytics, reporting, and 24/7 support. Founded in 2004, Shopify is a hosted option offering maintenance and support that is particularly helpful for smaller merchants with less technical experience. Shopify only recently experienced significant growth after the company announced a partnership with Amazon in early 2017. As a result, the platform released a new integration feature that allows merchants to sell on Amazon from their Shopify stores. There are now over 550,000 live websites powered by Shopify, which accounts for 10% of the market share for the top 10k eCommerce websites. Shopify notably has a similar market share to Magento in BuiltWith’s top 10k websites which shows how prominent the platform is. Magento, BigCommerce, and Shopify each have distinct advantages and disadvantages. The most important factors to consider when choosing a platform depends on the size and needs of your business. Below is a comparison chart with some of the essential features merchants look for when researching and analyzing platforms. Notable Features Offers an extensive features list for both Open Source and Commerce editions including: advanced reporting; social extensions; order management; catalog management; checkout, payment and shipping options; customer accounts; integrated dotmailer email marketing automation software; marketing, promotions and conversion tools; SEO tools; site management; streamlined Instant Purchase checkout, and more. Features an easy to use website builder for those without much web design experience. Merchants can easily add and manage products and offer common payment options. Other features include customized shipping, a tax system with dropshipping features, smart product rules, downloadable sales, email marketing tools, and SEO tools. Marketed as a platform with “no design skills needed.” Features include many themes to choose from, easily add new sales channels, manage unlimited products and inventory, fulfill orders in a single step, track sales and growth trends. Ease of Use Generally requires certified Magento programmers or partners for development and support, but the admin is more than manageable with training and experience. Considered to have a user-friendly admin but some users report back-end development to be difficult. Simple to use for small merchants who may be less tech-savvy. Users report that after a few hours of training to learn the basics, it’s easy to manage from there. Educational Resources Extensive training available via Magento U. Magento also has a thriving community with a wide expert presence. Training available via BigCommerce University Training available via the Shopify Encyclopedia, Forums, Guides and Tutorials. Magento, BigCommerce, and Shopify all have their pros and cons. The critical decision is choosing a platform that you can live with, and perhaps more importantly, can afford. Magento is a market leader for a reason. It is scalable, customizable and ready for global eCommerce. Magento is typically an excellent option for medium to large businesses with high-volume stores. Although potentially pricey for small merchants, Magento is a smart investment for merchants with large inventories and whose growth is dependent on a flexible and powerful platform. BigCommerce offers a decent option for mid-sized merchants who may need something more scalable than Shopify, but maybe not up for the robustness of Magento. BigCommerce provides all-inclusive pricing for hosting and support. However, some reports indicate that the support for BigCommerce isn’t as advanced as the Magento support community or of the Shopify customer service team. Mid-sized merchants on an upward trajectory could outgrow the platform and need to migrate to a more scalable platform. Shopify provides real benefits for smaller companies with all-inclusive pricing for hosting, support and set up. Shopify is considered user-friendly and a smart choice for the busy or less tech-savvy merchant. However, some users report running into a “Shopify Ceiling” noting that the platform can be very limiting for growing merchants. Flourishing merchants could quickly outgrow the platform and need to migrate to a more scalable platform. Still not sure which platform is right for your business? Contact us for more information about which of these three platforms might be the best fit for your eCommerce business.